There are times when I read a historically based picture book and hope that I can find great primary sources to accompany it. I felt this way when I read The Boo-Boos That Changed the World written by Barry Wittenstein and illustrated by Chris Hsu. Luckily, I was not disappointed and can not wait to use these sources with my students. If the title does not give away the focus of the story, Hsu’s cover and endpapers plastered with Band-Aids do. The story tells of Earle Dickson’s inspiration for and 1917 invention of the Band-Aid. It begins with Earle’s dedication to helping his injury-prone wife. 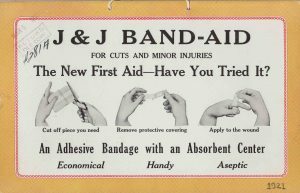 The tale continues with the evolution of the Band-Aid by Johnson and Johnson from a long cuttable strip to the individual bandages we know today. Wittenstein also explores the marketing of the Band-Aid that brought it from a flop to a success years after its invention. 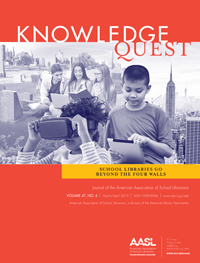 When viewing the book with primary sources, multiple areas could be explored. An image of the original Band-Aids and packaging we’re a must. 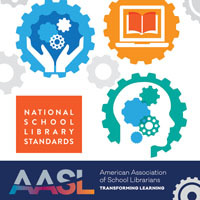 Other sources should be determined by how the book and primary sources would be used in student learning. There were two directions I headed in the search for primary sources. One message in the book was the innovative nature of Band-Aids themselves. There were trials and errors. It was improved and changed. And yet the bandages I use today are not the same as ones used in 1917 or even 1927. A search for Band-Aid advertisements would show changes and improvements made over time. A patent would illustrate specific elements of the bandage from the year of the patent. Another element that comes through in the story is the idea that Band-Aids are meant for someone. According to the picture book, they were initially meant for Earle’s wife, Josephine. Later, when the bandages weren’t selling they were given to Boy Scouts. Years after that, soldiers used them during WWII. 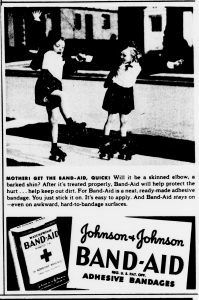 Advertisements may reveal who Johnson and Johnson thought Band-Aids were also made for. I targeted my curation of primary sources into these areas. 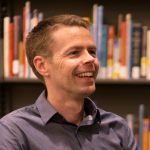 The curated list is available to download and can be used to brainstorm ideas of how these sources and the picture book may be used in student learning. Students may explore both the book and primary sources for improvements or alterations made to the bandage. When they come across confusing or unknown descriptions such as DryBak Band-Aid or Band-Aid with Mercurochrome, a simple search can reveal some information. Remind students to stick with reliable sources. Ask students to think about these changes to the product. Was there a problem that was solved? What was it? Did the alteration likely make the Band-Aid better? What drawbacks could there be? Explore new products to see what innovations are in place today. Are these original improvements to the Band-Aid still present? There may be some untapped scientific inquiries around chemistry and medicine that older students can explore. If looking at the consumer of Band-Aids, begin with the book and ask students to find who finds this product useful according to the story. Then transition to advertisements. A run of newspaper advertisements in 1939 and 1940 highlight people using Band-Aids. The curated set of primary sources connected with the picture book contain many of these ads. Begin by asking students to contextualize the advertisement. Who is likely reading a newspaper at this time? How can we tell this is an advertisement? What are advertisements meant to do? Ask students to analyze the advertisements through a consumer lens. What is being shown in the image? What is the text describing? What benefit is the product providing in the advertisement? What type of person is meant to use the product according to the advertisement? Is that same type of person likely reading this advertisement? If not, who related to this type of person is reading it? Students could also view and analyze Band-Aids television commercials. 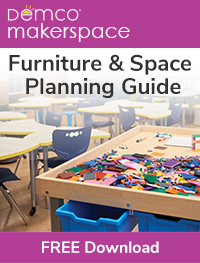 While not included in the curated primary source set, many can be found on YouTube. 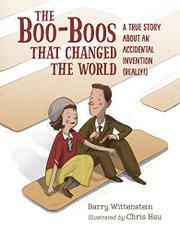 A story about the invention of Band-Aids is not just an enjoyable tale. Students can learn about a moment in history, investigate how a product changes over time to meet different needs for buyers, or explore how products are not only created for an audience but also advertised to them.